This one-of-a-kind kit offers an ideal introduction to a captivating and versatile art medium. 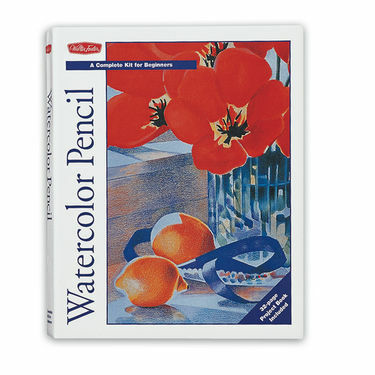 Watercolor Pencil provides aspiring artists with the materials and inspiration they need to begin drawing and painting right away, as it contains a full set of fine-art watercolor pencils along with a colorful project book that features seven stunning step-by-step lessons. The project book covers all the basic art techniques you’ll need, as well as information about more in-depth concepts such as color theory. Inside, you’ll find all the information and inspiration you need to begin creating your own watercolor pencil masterpieces in no time at all! Hardcover 9" x 11.25" case includes 32-page full-color paperback book, 20 fine-art watercolor pencils, pencil sharpener, round paintbrush, flat paintbrush, art paper, and watercolor paper.